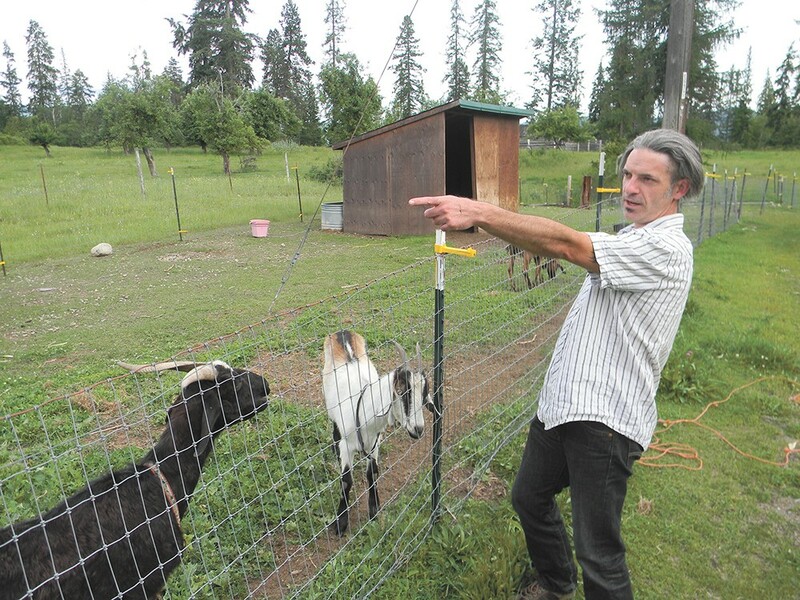 Tim Loe and his partner, Gina Britton, worry that something uphill is making their goats sick. The mysterious deaths began with the chickens. Gina Britton recalls how they became lethargic and their appetites decreased before their seizures began. "Their heads would arch back and their mouths would open, and they would look like they were gasping for breath," recalls Britton. "They would violently throw themselves on the ground." Next, the goats and the rabbits started having similar seizures before dying with their backs arched in the same contorted position. Neither Britton nor Tim Loe, her partner, expected this to happen when they purchased about 20 acres in the mountains outside of Northport in 2011. They bought chickens, goats and rabbits. They grew pears, apples and cherries. They wanted to leave behind city life, processed foods and exposure to everyday chemicals. They had their water tested to make sure it was free of contaminants. In the spring of 2012, when the snowpack thawed, the animals began dying. Loe came down with ulcerative colitis, a debilitating bowel disease that left him bedridden, sometimes for months. Britton came down with shingles that fall. In total, they say they lost about 10 goats and 100 chickens over the next two years. "We could never get our numbers up," says Loe. "So this is affecting our ability to even put together an agricultural operation." Just down the road, Gale Anderson says that four of her cats suddenly died last year within a week in February from what a veterinarian determined was kidney failure. "They just dropped over dead," she recalls. "I got up one morning and the one came into the kitchen foaming at the mouth and died." In March, her husband Glen suddenly had a stroke. Later in August, the day before she went to pick him up from the hospital in Spokane, the couple's miniature Australian shepherd died from kidney failure. Farther down the road, their nephew, John Murphy, says that this year two calves from his small herd of cows were born premature and one was stillborn. None of these residents of this remote and sparsely populated corner of northeastern Washington know what's causing these deaths and illnesses. The area is downwind and downriver from a smelter across the border in British Columbia. Although one study found an unusually high concentration of cases of ulcerative colitis in the area, government agencies haven't come to any conclusions on what kind of health effects the smelter is having on residents. Others suspect, however, that herbicides used by various logging companies in the area are really to blame. "There had to be something in the water that caused it because what else is there?" says Gale Anderson. "It could happen [again] to us any time." Back in the 1980s, Clifford Ward, a longtime area resident, planted trees in Idaho and Washington for the U.S. Forest Service. "In those days they almost never, ever sprayed [herbicides]," recalls Ward. "They'd clear-cut, and if they did anything, they would burn, and then we'd go in and plant from there, and everything always did fine." But he says that timber companies are now more inclined to use herbicides. Last year, Ward says that Inland Empire Paper Company, which owns more than 116,000 acres of timberland in northeastern Washington and North Idaho, contacted him, telling him they'd be spraying herbicides on clearcut land that drains into a spring he used for drinking water on his land outside of Northport. Ward says he asked the company not to spray. They did anyway, and he moved to Northport. "I don't know why some people think these herbicides aren't dangerous, if you just look at the back and read the warnings," says Ward. About two years ago, he says he was diagnosed with chronic inflammatory demyelinating polyneuropathy, a rare neurological disorder. He doesn't know what's causing it. In an email exchange, Paul Buckland, Inland Empire Paper Company's forest resource manager, writes that herbicides are expensive and are only used in low concentrations when weeds are aggressively competing with seedlings for sunlight, moisture and nutrients. "If herbicides are used at all, they are used only once in a forest cycle, which is approximately 80 years," he writes. "Federal and state laws are designed to prevent herbicides from adversely affecting water quality, people, animals, or aquatic life," Buckland continues. "As sustainable foresters, [Inland Empire Paper] meets or exceeds these rule parameters with prudent buffers that are installed by professionals and approved by the appropriate regulating agencies." In both Washington and Idaho, makers of pesticides and herbicides must register their products with the state Department of Agriculture. Products must include a label, approved by the Environmental Protection Agency, describing its dangers and how it is to be used. George Robinson, administrator of the Idaho DOA, says that his agency's primary regulation is making sure that label's direction is followed. Washington has more regulation on herbicides than Idaho; a company wanting to apply herbicides must apply to the state Department of Natural Resources for a permit. Washington requires buffers around homes, agricultural land and streams. Logging companies will hire crews to spray by hand. If a company uses a helicopter, they have to make sure the spray doesn't drift. Wyatt Golding, an attorney at the Washington Forest Law Center, says the public can look up permits on DNR's cumbersome website. But the permits are for three-year periods, and he says they don't say anything about what was sprayed, and when. Companies have to post signs indicating they intend to spray within five days, but he says that some residents still wake up surprised to see helicopters spraying land next to them. Golding adds that current regulations intended to keep herbicides out of water don't do enough to prevent them from getting into seasonal streams, domestic wells or groundwater. "There's a pretty good likelihood that it gets in the water," he says. Many problems between landowners and timber companies, says Golding, could be resolved with better communication. Megan Dunn, with the Northwest Center for Alternatives to Pesticides, says that her group is petitioning the state Forest Practices Board for a rule that would make info on spraying more readily available. Loe points to permits authorizing spraying uphill from his property, where he suspects it's getting into the spring he uses for water. He's particularly concerned about some of the chemicals sprayed in the area, such as 2,4-Dichlorophenoxyacetic acid, an active ingredient in Agent Orange, a powerful herbicide widely used during the Vietnam War; imazapyr, a non-selective herbicide which is banned in the European Union; glyphosate, which the International Agency for Research on Cancer says causes cancer in humans; and atrazine, which is also banned in the EU. Heather Hansen, executive director of Washington Friends of Farmers & Forests, a trade group that represents the forest products industry, says that before an herbicide is approved for use, it's thoroughly tested to make sure it's not harmful to humans or animals. Hansen says it's "incredibly unlikely" that herbicides get into the water, because buffers prevent logging near streams or waterways. "[Our regulations are] based on science and data, and the EU is often based on public opinion," she says. Stephen Fitzgerald, a professor at Oregon State University's College of Forestry, says that herbicides are applied in such small doses that they are unlikely to affect human health, especially if the instructions on the label are followed. He says that foresters apply them carefully, because they cannot afford to make mistakes. Hector Castro, spokesman for the Washington State Department of Agriculture, says that if foresters do make mistakes, there will be penalties. According to Castro, the department conducted 123 investigations involving pesticides or herbicides in the past year, 58 of which involved drift. Forty-five percent of the investigations, he says, involved some sort of enforcement action by the department. But Lisa Arkin, executive director of the Oregon-based environmental advocacy organization Beyond Toxics, says that the effects these chemicals could have on humans haven't been studied, nor has there been enough study on what kind of effects these chemicals could have when combined. "The fact that they are spraying this from helicopters just boggles my mind," she says. Across the border in Trail, British Columbia, Teck Resources Limited operates a metal smelter in existence since 1906. It has discharged millions of tons of slag, a glass-like byproduct containing toxic metals, into the Columbia River, as well as tens of thousands of tons of mercury, lead, cadmium and other heavy metals from its smokestack. In 1999, the Colville Tribe successfully petitioned the EPA to conduct an assessment of environmental contamination in the Upper Columbia River. Initial EPA studies have indicated that there is contamination in lake and river sediment, and a 2011 study found that in Northport, the number of diagnosed cases of ulcerative colitis were 11 to 15 times higher than elsewhere. However, government agencies, including the EPA and the Washington State Department of Ecology, have been unable to draw links between the pollution and any illness. "If you look at ulcerative colitis and what are [its] causes, at least from my understanding there is no definitive link," says Matt Schanz, environmental health director with the Northeast Tri County Health District. Schanz says the district conducted screening for lead blood levels, which are typically high in areas near smelters, earlier this year. The results found normal levels. Castro says the Department of Agriculture hasn't investigated any complaints from Loe, because he hasn't provided any evidence that there has been drift from aerial sprays, nor has he provided proof that the herbicides affected his animals. But Loe and Britton say they just don't have the money to have their dead animals tested. Last spring, their dog had a stroke, and two goats and 15 rabbits died. Loe keeps several dead rabbits in the freezer in hopes of testing them one day. They haven't had any die-offs this year, but DNR has issued permits for spraying on land uphill from them. Britton says they didn't even suspect herbicides were an issue until last year, when Ward discovered there was spraying in the area. EPA testing hasn't found any contamination from the smelter in their soil. Loe says that they tried to get their water tested for herbicides sooner, but the lab's $1,000 cost was too expensive. They convinced a lab to test for $150 this year. The results found no herbicides. Golding, of the Washington Forest Law Center, says that it's hard to detect the presence of herbicides in water or people, because the chemicals pass through water so quickly. CORRECTION: "Cause for Alarm" incorrectly reported that the Washington State Department of Agriculture conducted 58 investigations involving pesticide or herbicide drift from helicopters. Those investigations concerned drift from other sources and not exclusively helicopters.